I've never seen anything more adorable. It's a lesbian love story that makes you want to melt into goo and cuddle them. (In a good way.) The biggest reason to watch this film is just for the sake of seeing Yamada and Kase basically just be themselves. It's about the character observations. The reaction shots, the way the animators have captured everyone's emotions... it's just wonderful. It doesn't even have to be a romantic scene. Yamada's best friend, Mikawa, is just as much of a joy to have on screen, e.g. the scene where everyone's flying off to Okinawa on a school trip. Yamada's ridiculously excited to be in mid-air, while Mikawa's quietly shrivelling under a black cloud of dread. The film gets more serious in the last ten minutes, though, as the girls realise they're planning to go to different universities. Can love survive this? It's not often that you find a story that's so lovely that it's a downgrade to see it grow a plot and start going somewhere. We're not talking about a big downgrade, though. It's only comparative, because the film's so damn good when it's just pottering along with our heroines. Yamada inviting Kase over after school is a nuclear event that blows both their minds, for instance. There might be full-head blushes, eruptions of steam and/or Kase walking into a wall instead of the door. Yamada is a girly girl who likes gardening and is liable to get seeds sprouting from her head when her emotions are strong. She's a bit shy, but hopelessly, giddily in love with Kase. (The film doesn't waste any time, incidentally. They're getting together in the opening scene.) She's also very much the innocent of the duo. In one scene they're together in her bedroom and there's no one else in the house. Kase asks, "Would you like to do it with me?" A puzzled Yamada's reaction is "...a kiss?" Kase, meanwhile, is a sporty girl who's super-popular with everyone. She's definitely not as pure-minded as Yamada, but she'd never dream of doing anything Yamada didn't want and she's equally giddy that they're together. I laughed out loud at her electrified reaction when Yamada's mobile phone goes off just as they're getting hot and heavy. There's not a lot to talk about here, because the plot's not the important thing here. There's a bit towards the end and it's convincing. I've no complaints in that department at all, but I loved this film for the little throwaway things. It might be watching Yamada on a day when Kase is forced to stay away from school. Maybe Yamada's face when Mikawa asks if she's going out with Kase. Her girly wriggle and squeal just because Kase's upstairs. They're adorable! (Reading an interview with the director, it sounds as if those things I loved were exactly what made this a passion project for him.) When there are obstacles... wow, they take them seriously. All that said, I'm sure I loved this film more than most people. 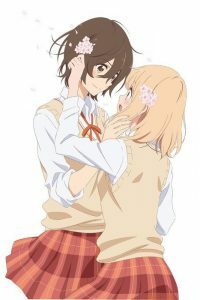 Its virtues, for me, are so subtle and ephemeral that there will certainly be lots of fans who watch it and just go "yuri romance, sort of nice, not much plot". Personally, though, I think it's special. Oh, and make sure you watch the happy little moment after the end credits.